Most of the time, when I look at what's trending on Facebook, the stories are sordid or vapid. "Kim Kardashian dyes her hair blonde" would be an example of a trending story that, to me, just isn't really newsworthy. Most of the time, it's not worth my time to check out any of these "trending" stories. But there's been one that has captivated my interest and profoundly touched my heart. Back in October, what was trending was country singer Joey Feek would not seek further treatment for cervical cancer which had spread. I had never heard of Joey Feek before seeing this on Facebook. Reading her story, I learned that she was only 40 years old and married to Rory Feek and together they were the duo Joey + Rory. They had an adorable baby girl, named Indiana, who happened to have Downs Syndrome. I didn't know anything about Joey Feek, except she was talented, beautiful, and in an impossibly unfair situation. 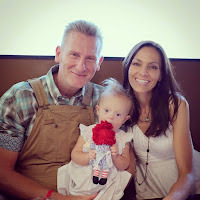 But her husband, Rory Feek, has been telling her story in the most beautiful way through his blog. (Technical issues prevent me from sharing it here- but if you Google "Rory Feek's blog- This Live I Live" you should find it! It is worth the read!) His writing has stopped me in my tracks many a morning. The faith, hope, and love Joey and Rory had at life's most painful time was almost refreshing and inspiring in a way that I can't even really describe. Joey set a goal to live to her daughter's second birthday and she made it. The pictures of her and her little girl together just emanate love. Through Rory's writing, I learned that Joey liked to garden and grow food for her family to eat. She would save eggshells and plant in them. Joey planted many seeds while she was sick this winter, in those eggshells, to be replanted at her family farm. She also planted some for her parents and her sisters. She recorded herself reading stories for Indiana. And, in a wild twist of life imitating art, years ago Joey + Rory recorded a song called "When I'm Gone", where Joey was singing to Rory about life after she dies. Neither of them every expected for Joey to get sick and for the song to become reality. Rory wrote how he felt this song would help him learn how to live without Joey, that her voice would help him find the way to go on. Tonight, Friday, March 4th, as I type this, Facebook is trending again with news of Joey Feek. She passed away tonight, after many brave months of fighting a losing battle with an aggressive cancer. She leaves behind a husband, a little girls, parents, sisters, friends, and many fans. Her life here on Earth is done, but her story lives on. This is the power of blogging. Rory Feek's posts have helped me to know his beautiful wife, not just the picture on a webpage, but the person. Though Joey Feek and I never met, the stories her husband told about her and her example of grace and faith are now part of my mind and heart. I will think of her often. I will think of her on the days when I feel sorry for myself and when I'm short tempered with my children. I'll remember forever is not promised to any of us. On Saturday, I will facilitate a workshop for the Long Island Writing Project on blogging. 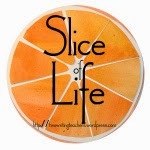 I'm here, doing the Slice of Life Story Challenge, and my third grade students are blogging each day, too. I'm starting an after school blogging club for 4th and 5th graders next week. I've almost blogged myself out...but tonight, Joey's story, as told by her husband's blog posts, reminds me that the reason all of this matters so much is because we are better people when we share our stories. That by sharing our story, and reading others stories, we have the power to connect and learn from people all over the world. And so, despite all the non-newsworthy items that trend on Facebook, I will still continue to check, because sometimes, sometimes a story comes along that, by reading it, changes you. Rest in Peace, Joey Feek. You won't be forgotten.